SINGAPORE, Apr 9, 2019 - (ACN Newswire) - Grand Banks Yachts Limited ("Grand Banks") announced that it will unveil the Palm Beach GT50 - a sleeker, faster and fuel-efficient newly designed luxury yacht which has won major international awards - to Asian buyers at the April 11-14 Singapore Yacht Show 2019. 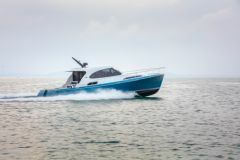 The GT50 made its international debut last September at the Newport International Boat Show, where it swept awards for 'Best New Powerboat over 35 Feet' and 'Best Powerboat Overall'. The Grand Banks display was also named overall 'Star of the Show' for presentation and marketing during the show. 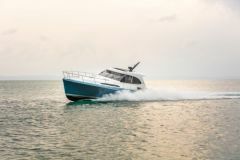 Grand Banks Yachts said visitors to the Singapore show at ONE15 Marina, Sentosa Cove, will be able to view a yacht praised by enthusiasts for its "true innovation". The GT50 features a fully infused vinylester cored e-glass construction, combined with a fully infused 100%-carbon fibre deck that is structurally bonded to the hull, forming a shell that is lightweight and robust, with a low centre of gravity. More efficient than its predecessors, the GT50 consumes only 40 gallons of fuel per hour while cruising at 35 knots. Fitted with twin 600-hp Volvo IPS800 engines, the 54-foot boat can reach a maximum speed of 40 knots. Listed on the Singapore Exchange, Grand Banks Yachts has recorded up to 3 orders for the GT50, helping to lift its total order book to 21 boats as at February 2019. With facilities in Malaysia, Australia and the U.S., the Company builds and sells boats under two global brands - Grand Banks and Palm Beach. The GT50 is the first in the new Palm Beach GT series that will also include the GT60 (slated for release in late 2019) and the GT70. "We are delighted to bring a truly innovative new boat design to the Singapore Yacht Show. Asian buyers are increasingly discerning, with younger enthusiasts emphasising design elements, fuel efficiency and speed as much as stability and safety. The GT50 ticks all the boxes," said Grand Banks Yacht's Group CEO Mr. Mark Richards, who is also a champion competitive sailor. Grand Banks, a renowned manufacturer of luxury recreational motor yachts for over 60 years, has designed and developed vessels that have become icons among boaters across the globe. While staying true to this heritage, Grand Banks continues to defy the expectations of yachtsmen with its timeless style, unique innovation and unyielding commitment to quality. The Group manufactures yachts under the Grand Banks, Eastbay and Palm Beach brands out of its manufacturing yards at Pasir Gudang, Johor, Malaysia, and Berkeley Vale, Sydney, Australia. The yachts, which range between 42 feet and 70 feet, have a reputation for impeccable quality that delivers an unrivalled performance. Grand Banks was listed on the Singapore Exchange Limited ("SGX") in 1987 and upgraded to the Main Board in 1993.